It was basically a crime that St. Lucia’s first album, ‘When The Night’, didn’t receive a worldwide release back in 2013. Its bright, sunny, tropical pop was perfect for the summer, but alas it wasn’t meant to be. Now it’s finally available over here, and just in time for the release of its follow up, ‘Matter’ – an album that swaps the relaxed synth vibes for a boisterous, 80s sound. Synth stabs, heavy beats and glittery effects all feature heavily. It’s like the best bits of Chvrches, Passion Pit and M83 thrown together. That certainly rings true on the album’s extended centrepiece, Rescue Me. It’s six and a half minutes of pulsing synth basslines and hypnotic rhythms that owes a great debt to the likes of Pet Shop Boys and Frankie Goes To Hollywood. It’s more focused than much of the album, though it does border on pastiche. 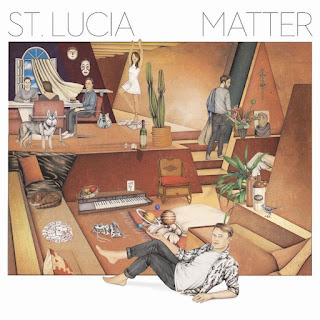 The album is at its best when St. Lucia, a.k.a South African born Brooklyn-based Jean-Philip Grobler, throws everything to the wind, resulting in a bombastic display of kitchen sink dramatic production. Each track is thickly textured with layers of electronic effects, bold melodies and bursts of neon vibrancy. It’s impossible to resist. Lead single Dancing On Glass is like a more uplifting take on M83’s Midnight City, the frenetic Physical will have your feet moving and your head in a spin, The Winds Of Change gradually crescendos part by part towards a glorious chorus, and Help Me Run Away is part giddy dance track part migration anthem. It’s a frantic, relentless and dizzying concoction that only slows on Love Somebody, a gentle electro-R&B track of yearning melodies (“I wanna love someone, I wanna love somebody”) and a smattering of tropical oriental flavours. It’s a rare moment of calm, but proves that much of Grobler’s music is underpinned by genuine emotion. Closing track Always pairs a lurching beat with the weight of a breakup, it’s chorus full of longing with its repeated “Baby I’ll remember you”. ‘Matter’ is the sort of album that blasts you full force into submission. Yet Grobler is clearly a master of hooks, pairing bombastic production with underlying sensitivity. He’s a pop force to be reckoned with. Listen: ‘Matter’ is out now.